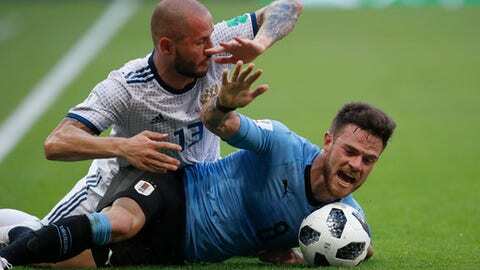 MOSCOW (AP) Russia is set to switch to five at the back for its World Cup round of 16 game against Spain on Sunday. Fyodor Kudryashov will join Sergei Ignashevich and Ilya Kutepov in the center of defense, with Mario Fernandes and Yuri Zhirkov on the flanks. Russia used a four-man back line in its three group games. In midfield Daler Kuzyaev, who came on as a substitute in all three group games, gets his first World Cup start in place of the dropped Yuri Gazinsky. The winger Denis Cheryshev, who was raised in Spain, is on the bench despite having scored three goals so far, while backup right-back Igor Smolnikov is suspended after being red carded in Monday’s 3-0 group-stage loss to Uruguay. Russia is playing its first World Cup knockout game in the post-Soviet era. The winner will play either Croatia or Denmark in Sochi on July 7. Russia: Igor Akinfeev, Mario Fernandes, Ilya Kutepov, Sergei Ignashevich, Fyodor Kudryashov, Yuri Zhirkov, Roman Zobnin, Alexander Golovin, Daler Kuzyaev, Alexander Samedov, Artyom Dzyuba.